The other night I went down to Smith’s Beach to catch the sunset. A young girl, complete with walkman, arrived about the same time as I did, and went off towards Torpedo rocks for a run. She was gone for quite a while and returned Later. At just the right place she stopped, and began doing stretching exercises. I have cropped the bottom of image since I originally posted it. I think this version conveys the feeling of the wide expanse of Smiths Beach better, and highlights the girl better. Cropping the bottom off has given it a more panoramic look that seems easier to look at. However the original version had more of the the dark expanse of water at the bottom of the image and had a moody, unsettling effect (at least I thought so). Perhaps there are two worthwhile images in this. Here is the original. Does anyone have a preference? This entry was posted on May 27, 2011 by ianwiese. 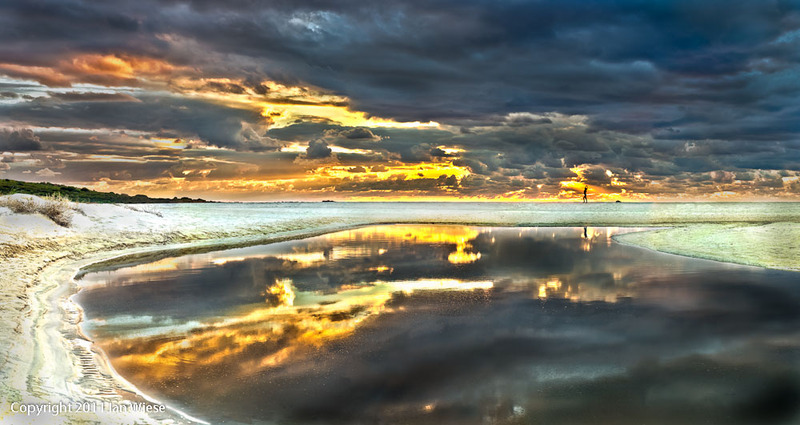 It was filed under Landscape, Smiths Beach and was tagged with reflections, Smiths Beach, sunset. Love the colours in this one Dad!! The ladies silhoette looks great – just in the right spot!! Thanks Mel. It is good to get something like that in a shot, as otherwise you have these great leading lines leading your eye to nothing! The edge of the river drags your eye right around to her. She’ll probably never know how much I appreciated her stretching exercises (from a photographic point of view of course!). Yep the cropped version does look better and the person gives the image some scale as well. Thanks Mark. For those of us who know Smiths beach the cropped version does seem to represent the wide beach better. When I cropped it, it immediately felt better. It was a hard image to process, and I think I had 3 goes at it (and that was before cropping it).